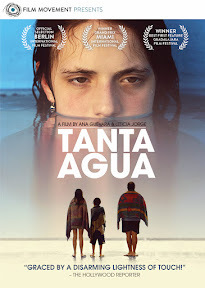 A feature filmmaking debut that adheres to its English translated title phrase, Tanta Agua makes good on the promise of So Much Water while likewise taking the connotative extremes of the middle word to heart, which the co-writers/directors use as a cinematic maxim to highlight the highs and lows of not so much coming-of-age as simply being an awkward teen. A visually impressive if ultimately flawed work of stylized neorealist slice-of-life, Agua serves up so much water and so much beauty with so much silence in a fly-on-the-wall approach they use as a diversionary tactic to fill so much empty space and screen-time where something resembling a plot would normally be. Tragically rather than add to the motif, all this technique does is accentuate the fact that despite so much potential, Tanta Agua is about so very little and doesn’t have all that much to say... at least in the format of a feature film. Of course, it isn’t necessarily true that you need a rather large amount of plot to tell a story as Sofia Coppola proved in her Oscar winning chronicle of two lonely strangers who connect to one another out of loneliness, cultural confusion, marital dysfunction, and coming-of-adult-age angst in her Antonioni and Wong Kar Wai inspired Lost in Translation. Sadly for the two award-winning short helmers who make their long form debut in Agua, while their gorgeous picture seems thematically and visually influenced by Coppola’s game-changing work, the story they’re trying to tell in Agua would’ve been a much better fit for their previous succinct storytelling medium of short filmmaking. Nonetheless as it stands (or crawls) in its tale of divorced father trying to bond with his children on a rain-drenched and bad luck filled vacation, Ana Guevara and Leticia Jorge’s Agua is still far more relatable and affecting than Coppola’s out-of-touch Somewhere, which centered around an apathetic, privileged movie star father attempting to do the same in an emotionally cold work. While Coppola relied on Vogue magazine layout-like visuals and a trendy soundtrack to try to distract us with the moodily cool ambiance of her surface-level effort, Guevara and Jorge wisely chose to highlight the natural beauty of real, everyday life in their Uruguayan production. Yet in spite of its universally identifiable set-up that everyone in the world can appreciate regardless of age, language and gender, Agua begins to get lost at sea by the end of the first act. 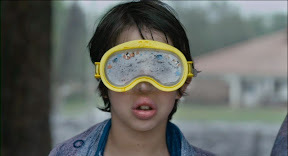 Structurally sitting on the sidelines – much like its characters – they filmmakers are content to let us watch the rain, assuming like a delayed baseball game, once the weather cooperates, surely something will happen. How wrong we were, it turned out. 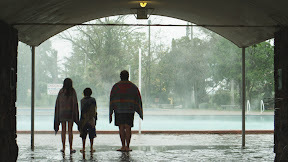 Perhaps viewed by his children as an effort he’s made that’s too little too late, the divorced middle aged father of an eleven year old son and a perpetually sour-faced fourteen year old daughter brings them to a resort where they’re inundated by inclement weather and stuck inside in their rundown motel room from day one. Though it boasts all the ingredients for a family-bonding film or a coming-of-age summer vacation story (which Film Movement’s back-cover summary description makes you assume it will eventually embrace), Guevara and Jorge’s film takes a half-hearted last act shortcut to embrace these themes with a handful of scenes that feel completely contradictory to the tone established earlier on. All in all, it's a disingenuous penultimate sequence that might've paid off much better if we’d seen more than a spark of a connection between the three unlikely relatives earlier on. 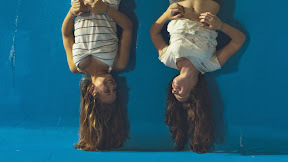 Unfortunately, up until that point, we’ve had to infer way too much about the past and present of its characters (that seldom speak during the film’s first full hour) over a series of awkward exchanges that take place across the lazily episodic narrative that a friend likened to the excitement of watching paint dry. Never attempting to build an audience attachment to its main characters, Agua divides up the screen time unevenly between the father and daughter and leaves some of its most important details (including a bike accident etc.) offscreen, breaking multiple basic storytelling rules from start to finish. While on the surface it's about that difficult time in your life when everything your father does embarrasses you mostly because you haven't found your way, again, this point is made within the first act alone of what feels like a feature-length filmed pitch movie that's been made to sell the "idea" of a better film. A disappointing debut that’s all the more upsetting because of how much promise and talent was wasted, Agua may have played much better as a domestic anthology comprised of three short films spliced together with each one told from a different point-of-view just to capitalize on the filmmakers’ backgrounds and strengths. In an intriguing coincidence, I viewed the work right after Filmmaker Magazine posed a discussion-worthy question in an article that asked whether or not short films were still important or worthwhile given how easy it is to make a feature today on everything from a phone to a webcam if you’re so inclined. However, just because you can make a feature, it doesn’t mean you necessarily should. Namely, despite its success at film festivals of audiences that were perhaps as taken in by the beauty of the film as I was more than the actual movie, Tanta Agua is proof that it’s still a vital and necessary art-form. For in addition to offering filmmakers tremendously valuable experience, it also makes screenwriters question just how many pages (or scenes for editors) are really required to bring the most effective version of the story they want to tell to life. 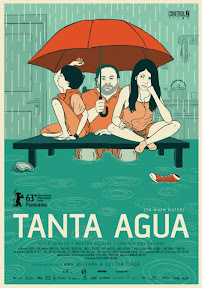 Unfortunately, Tanta Agua takes 102 minutes to deliver a film that might’ve been best brought to life in the span of a twenty-minute rainstorm.